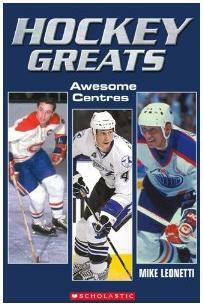 In what appears to be the first in a series of new titles from Scholastic, veteran childrens/young adult author Mike Leonetti offers us Hockey Greats: Awesome Centres. The book, aimed at ages 9 through 12, looks at the lives and careers of three of hockey's greatest players: Jean Beliveau, Wayne Gretzky and Vincent Lecavalier. The 110 pages are full of surprisingly in depth biographies and color photos as well as statistics and facts. The book is very eye catching and, despite the lack of contemporary star players, the book is sure to be a hit with its intended audience. Knowing nothing about the book previously, I was surprised, almost disappointed, that only three centers were featured. Why not include today's biggest star Sidney Crosby? Or why not the amazing story of cancer survivor Mario Lemieux? As pleased as I was about the quality of the features presented, I would have liked to have seen more players profiled. I suppose that would have come at the expense of space and content on the players that were profiled. Making a book aimed at 9 to 12 year olds notably thicker probably isn't viable, either. Perhaps more centers will be featured in a subsequent book? I figured the next book in the series would be about goalies or wingers or defensemen. Otherwise the book is a fine read, full of fun facts and stories. It is going to be a popular buy from those Scholastic catalogs elementary school students. This first title in Scholastic's Hockey Greats series explores the lives of three fantastic hockey greats: Jean Beliveau, Vincent Lecavalier, and of course, "The Great One" himself, Wayne Gretzky. Each of these biographies goes beyond the well-known stats and really examines what made these players superstars. Highlights include: significant games, milestones, Stanley Cup championships, as well as extensive stats and records. Full-colour photos of these legendary players accompany the text, and help give a thorough portrait of true hockey heroes.